a man, you are a lucky man, today! The card Short Illness is standing for the bed. And for activities, you can do in bed. So it is the card of active sexuality. This means, tonight you will not sleep alone in your bed! And maybe all next nights, too. If you go out today, then you will get in contact with a beutiful and funny lady. The Kipper Tarot card short illness shows you a weakened situation, business is stagnant, career is not all well, material things (car, motorbike) have problems. 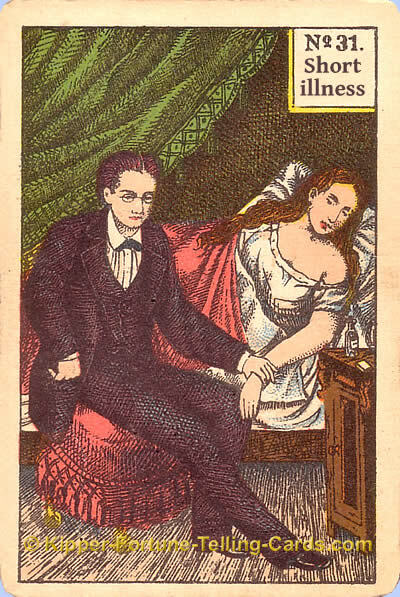 This card is also the bed card, the card of sexuality. Disease are an outcry of the body - to finally change something.